Live entertainment enhances the atmosphere of any nightclub or lounge and Al Mushref nightclub in St. George Hotel in Dubai makes use of this perfectly. The Arabic themed venue has belly dancers that perform on the stage at regular intervals. The dance acts are followed by singers from Lebanon who perform popular songs that include romantic ballads and pop favorites. Al Mushrif club has even more entertainment to offer, thanks to the live band that plays sets all through the night. The combination of live musical and dance performances are a great backdrop for the food and drink service. The menu contains popular Lebanese cuisine like tabbouleh, fattoush and hummus along with heartier dishes like Sheesh Taouk and Shawarma. The bar has most beers, wines and hard liqour for sale all through the night. For tourists and visitors that are looking to experience the best of Lebanon, Al Mushref is a great place to start. 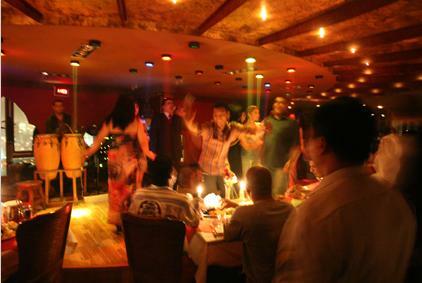 - Live music, belly dancing and a Lebanese orchestra are some of the highlights of Al Mushref nightclub. The seating arrangement in the venue is well thought out and allows all customers to view the stage and enjoy the music and dancing. - The Lebanese cuisine on sale is amazing and any food lover will enjoy the experience. Most local favorites are available and service is friendly and efficient. Guests should ask the staff about any food they are not able to understand from the menu. - The bar has many different types of drinks for sale and the staff can bring the drinks straight to the dinning table. Visitors should get off at Al Ras Metro Station 1 and head southwest on Al Khor Street. They will then need to take a slight left while staying on Al Khor Street. The commuter will then need to make a left turn toward Al Ahmadiya Street. They will then eventually make a right turn onto Al Ahmadiya Street and find the venue on the left. View Map. An alternate way to get to the venue is to use bus route number 27, 31, 53, C4, C7, C9 and C28 to get to Al Ras Public Library stop. From there go southeast on Baniyas Road and turn left onto Al Ahmadiya Street. View Map.